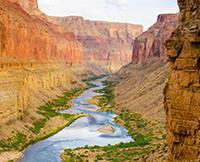 Western River Expeditions has wonderful staff with smooth flight arrangements to and from the Grand Canyon. The food was plentiful but too much preserved items as canned vegetables. Items also contained too much sodium which caused ankle swelling in quite a few passengers. The whitewater rafting on the Colorado River was wonderful with great side trips. Great meeting people from all over the country and had a great time overall. Not many people get to see the Grand Canyon as my family did. Great memories. This was a one of a kind experience.